Tere Naal Love Ho Gaya is the exception that proves the rule. You know – the one that says all real-life couples have absolutely no on-screen chemistry together. I know there are a few other exceptions out there (although mostly I’m thinking of Hema and Dharmendra films), but they’re few and far between. 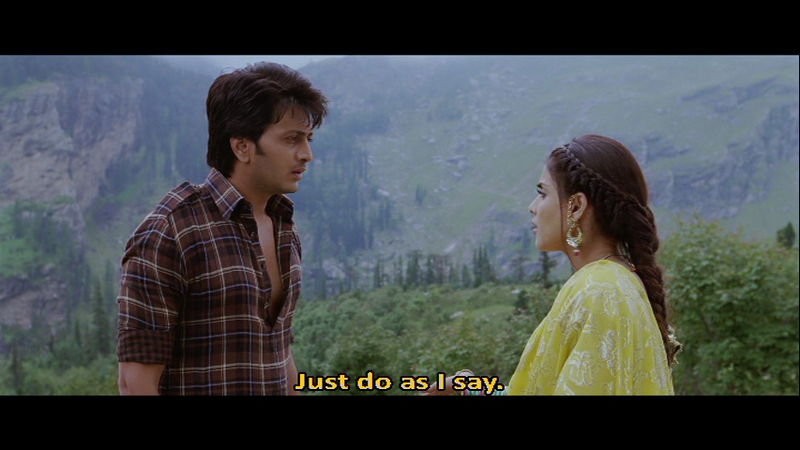 But here, Riteish and Genelia share an excellent rapport which makes the film much better than it sounds on paper. There isn’t anything too different in the way of plot, dialogue or even the characters but the excellent performances of the lead cast make up for a lot, with the end result of a light but entertaining romantic comedy. Great disclaimer in the opening credits too – always good to see animal safety concerns addressed! Viren (Riteish Deshmukh) is an auto-rickshaw driver who starts work early every morning in his attempt to save up enough money and realise his dream of running his own fleet of cars. But he makes two crucial mistakes. 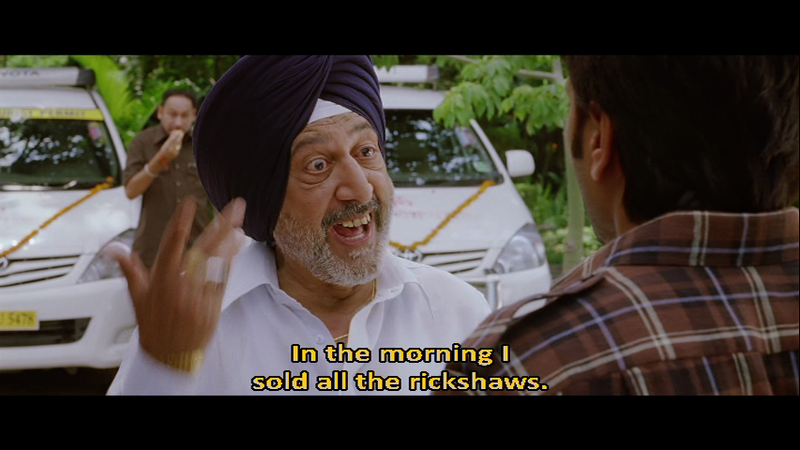 He keeps his savings under the seat of the auto, and he tells his boss Bhatti (Tinnu Anand) about his dream. So when Viren turns up for work and finds four cars instead of a rank of auto-rickshaws he’s understandably rather upset. In a weak moment, he drowns his sorrows in alcohol and turns up at Bhatti’s house demanding compensation for his loss just as Bhatti’s daughter Mini (Genelia Deshmukh) is getting engaged. Mini makes the most of Viren’s drunken appearance and forces Viren to kidnap her at gunpoint in order to escape her rich but brainless suitor Sunny (Kartar Cheema). Mini is the driving force behind the abduction and much of the comedy in the first half comes from her ruthless manoeuvring of the hapless Viren to escape pursuit and demand a ransom from her father. I’m sometimes a bit ambivalent about Genelia. I like her when she’s not in manic, hyperactive pixie-mode and there are times here where she veers dangerously close to that. But for most of the film she plays the ruthlessly selfish but bubbly and personable Mini with charm and vivacity and provides the perfect impetus to drive Viren relentlessly out of his comfort zone. I ended up liking her character more than I expected, particularly in the second half and I think that overall this is one of her better performances. She gets to pull some great faces and wear some lovely costumes, although my favourites are these pajamas covered in little flip flops. Viren is totally over whelmed by the phenomena that is Mini and Riteish is excellent as the poor but principled auto driver whose life has been completely turned upside down. I do really like Riteish. His presence ensures that I will watch a film, no matter how dire it sounds and he’s always worth watching. I’m very impressed that he has a second career as an architect but he’s a good actor, especially in comedic roles, and, perhaps rather worryingly, he frequently looks much better than he should in a dress. As much as I love him though, he’s not really my idea of leading man material so I was very impressed that he did so well with his role here – despite a few fashion faux pas and a tendency to try to imitate SRK in the songs. Unsurprisingly Mini and Viren end up falling in love during a rather strange drunken night at a wedding. While it’s totally predictable that the two get together, the romance isn’t well developed at all and it’s just assumed that being forced together by the circumstances is enough of a reason for a relationship. However the chemistry between Mini and Viren is convincing enough to give some plausibility to the proceedings and it’s hard to complain when they do look so good together. The second half of the film moves to Viren’s family home where his father is the notorious kidnapper Chowdhary (Om Puri) – a man so well-known for his criminal proclivities that his mansion is called Agwaha house. But despite this clue he appears to live there quite unmolested by police or other persons of authority and is free to pursue his chosen profession as and when he wishes. Om Puri is always good value and I liked his curmudgeonly and testy Chowdhary. His scenes with Genelia are some of my favourites as she gradually wins his affection and as a result he continually increases her ransom price. Smita Jayakar is also good as Viren’s mother and the looming presence of the silent Gurmeet Saajan as Viren’s uncle who keeps popping up in the background made me laugh more than it really should. Viren also has a sister played by Chitrashi Rawat who was better than I expected given the few brief times I’ve seen her since her debut in Chak De India. The rest of the cast are all good in their stereotypical roles but generally they don’t have much to do. 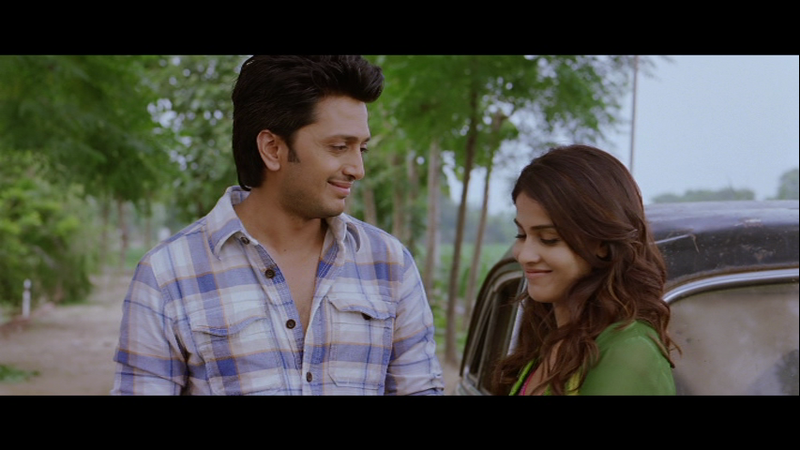 Apart from the excellent performances from Genelia and Riteish there are other good points about the film. The cinematography is excellent and Chirantan Das makes the countryside look incredibly beautiful. The interior shots around Chowdhary’s house are also well shot and there is good use of light and colour throughout. The songs by Sachin-Jigar are enjoyable, although the item number suffers from poor choreography and rather too much of Veena Malik but the music is good. The other songs are better pictured although neither Riteish nor Genelia are particularly good dancers but what they lack in technique, they make up for in enthusiasm and since they’re both supposed to be drunk in this song the lack of co-ordination may even be deliberate. Tere Naal Love Ho Gaya is the debut film by director Mandeep Kumar and writer Abhijeet Sandhu. It isn’t brilliant, but it does have it’s moments and I found it an enjoyable watch with a very likeable cast. The whole film has a feel-good flavour and it’s a good lazy afternoon movie for when you don’t want to have to think too much. Worth watching for the excellent performances by the main leads and Om Puri’s scenes with Genelia. 3 ½ stars. This entry was posted in Bollywood and tagged Chirantan Das, Chitrashi Rawat, Genelia, Genelia D'Souza, Genelia Deshmukh, Gurmeet Saajan, Kartar Cheema, Mandeep Kumar, Om Puri, Riteish Deshmukh, Ritesh Deshmukh, Sachin-Jigar, Smita Jayakar, Tinnu Anand, Veena Malik. Bookmark the permalink.